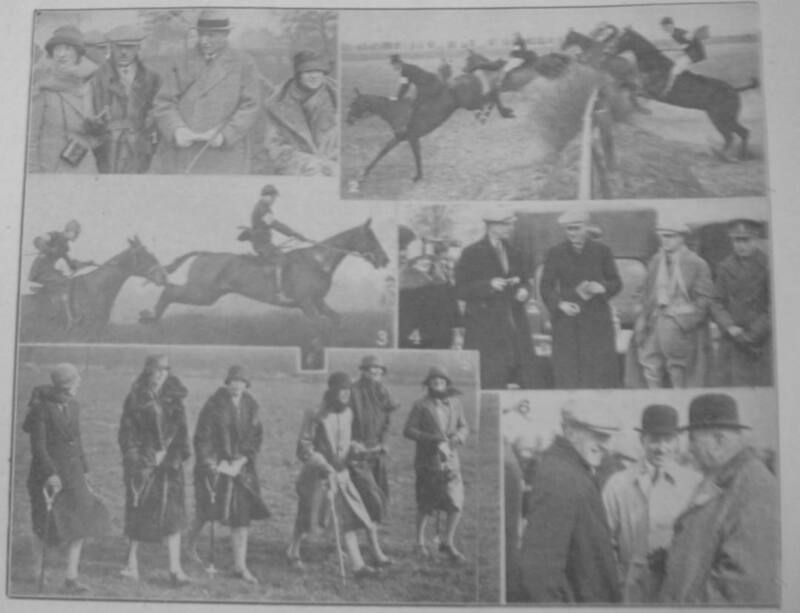 The Garth Hunt Point-to-Point Races were held on Tuesday [23rd March 1926] at Arborfield. (1) Miss M. Carey, Col. Benwell, Brig-Gen. Baldwin, Miss Bailey. (2) An early fence in the Nomination Race. (4) Lady Cooper, Mr. C. S. B. Thompson, Mr. H. J. R. Stent, Sir Daniel Cooper, Mr. C.K.D. Cooper. (5) Off to the jumps, Miss Hacon, Miss L. Pritchard, Miss Brackenbury, Miss M. Kayes, Miss E. Pritchard, Miss P. Kayes. (5) Lady St. John Mildmay and General Sir Philip Chetwode. The Garth Hunt Point-to-point Races, held at Arborfield Remount Depot on Tuesday, were attended by large numbers from the surrounding districts, and fine weather prevailing, an excellent day's sport was experienced. Among the many interested spectators was H.R.H. Prince Henry. [A long list of officials followed, led by the Marquis of Downshire, and including several parishioners]. An excellent course was provided, with fairly simple jumps and not too difficult going. The crowd began assembling early in the day, and by one o'clock some thousands were present. A collection was taken up amongst them for the Hunt and this amounted to £6 - 15s. The band of the 1st. Batt. K.R.R.C. was in attendance. Some excellent races were witnessed, and there were several very close finishes. [Detailed list followed]. At the conclusion of the events Mrs. Howard Palmer presented the cups and prizes. Mr. E. M. Sturges, in proposing a vote of thanks to Mrs. Palmer, said as hon. secretary of a Hunt that bore perhaps the most honoured name in England, he was more than thankful to know that they jad members like Mr. and Mrs. Howard Palmer, both of whom took such an interest in all kinds of sport. There was nothing like fox-hunting, which had no politics in it. He called for three cheers for Mrs. Howard Palmer, a call which met with a hearty response. Mr W. Howard Palmer returned thanks, and remarked that the last Garth Point-to-point Races were held in a snowstorm. He said that they would hardly wish to disperse without passing a hearty vote of thanks to the committee of the Garth Hunt, who had managed the races so well, and especially to the hon. secretary, Mr. E.M. Sturges, and Mrs. Sturges (Applause). 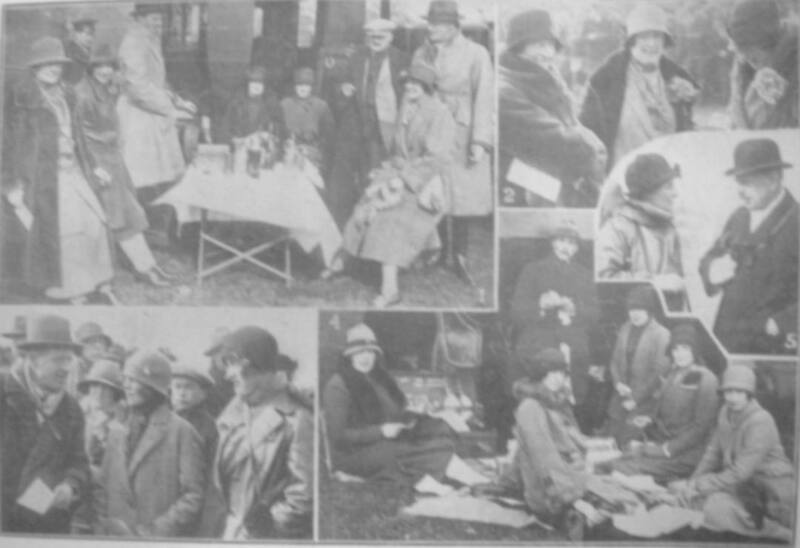 During the afternoon Mrs. Howard Palmer presided at a tea tent. The farmers were also provided with lunch and tea. The catering was capably carried out my Mr. J.E. Allnatt, of Earley. This is the course of the Point-to-Point at the Remount Depot. 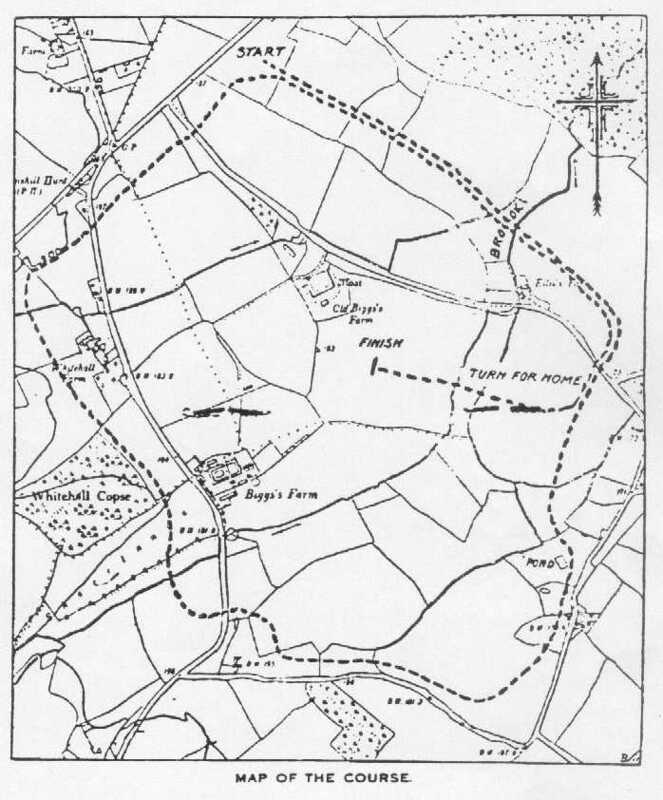 Many of the landmarks noted on the map have now disappeared under Arborfield Garrison, and in turn by Penrose Park and Badger's Mount housing developments. Acknowledgement: Colin Farnell F.R.I.C.S., F.S.V.A. The 'Reading Mercury' of Spring 1926 was full of classified advertisements for Point-to-Point races. For the Garth Hunt, an invitation to competitors was carried on February 27th and repeated on March 6th, followed by an invitation for spectators on March 13th and repeated on March 20th. Here is the text for the adverts. In addition to the two Hunt Races and Farmers’ Race there will be a Nomination (Open) Race. All particulars from Hon. Secretary, Lt. Col. W. Q. Winwood, Ridge Cottage, Finchampstead, Berks. This Meeting is to be subject to the Rules and Regulations of the M.F.H. Association and National Hunt Rules 5 and 164-168 (disqualification of persons and corrupt practices). The R.M.C. Cadets’ Races will be run in conjunction with the above. All ‘Buses start 11.0 a.m.